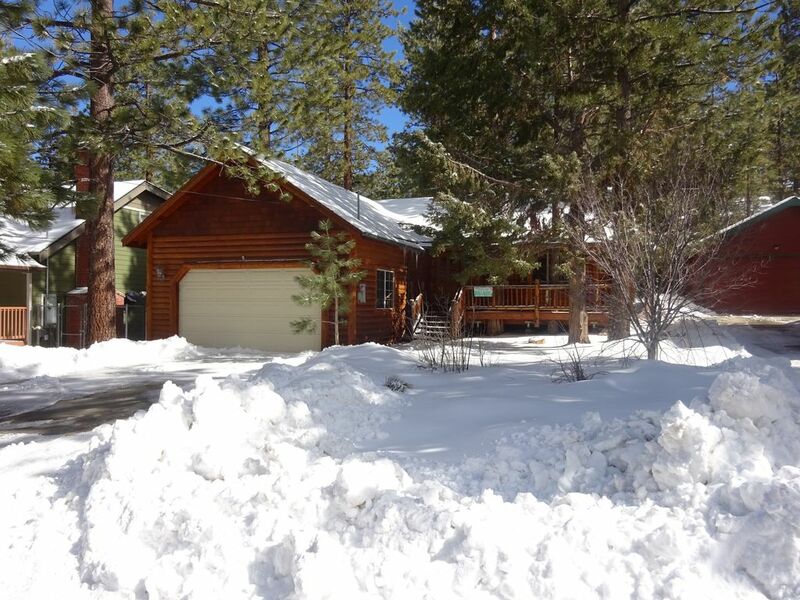 3 Bedrooms, 2 Bathrooms, Sleeps 10, 1600 sq. ft. Beautifully Decorated Cabin Near the Lake. Walk to the park, the lake and swim beach! Dog friendly cabin with a fully fenced backyard. This beautiful home has every bit of "log cabin" atmosphere as you could want during your mountain escape. It has a comfortable open floor plan with high ceilings that is light, bright and spacious. The large kitchen has a center island that opens up into the great room. The great room features a stunning custom built rock fireplace that is gas-burning, so no need to hassle with firewood, kindling or ashes! You will also find a large 36 inch television with DVD player for your entertainment. Both bathrooms contain full jetted tubs to melt your city worries (and sore ski, hiking, biking or boarding muscles!) away. The master bedroom is large and contains a luxury Tempur-Pedic California King sized mattress. Direct access to the back deck can be had through the French doors that stand next to the spacious walk-in closet. Also, a flat screen television and DVD player are available in this room for your convenience. The large back deck contains a gas barbecue, and the entire backyard is fenced. CENTRALLY LOCATED, immediate area attractions include a two block walk to the lake and swimming beach! Here you can also find horseshoe pits, a sand volleyball court, two children's playgrounds, a picnic area, tennis courts and baseball fields. McDonalds and 7-Eleven are also only a short block and a half away for those late night cravings. Snow Summit chair lifts are less than a mile; The Village, and boat rentals are only one mile away. Kid Friendly Features: Fenced backyard, walk to the park with 2 playgrounds and swim beach. Gas fireplace. No wood needed. Regular coffee pot and a Keurig 2.0. We had a great time, staying in this house last week. It was very comfortable and we loved the kitchen. We will be back next year, for sure. We had a wonderful time with family. The home was beautiful, clean, comfortable. Exactly what we needed. Thank you to the owners for sharing their beautiful home. Our family made a priceless memory! We had a great time and rarely left the cabin. The location is great and the layout of the cabin was wonderful. The only drawback is the firmness of the beds. My family all has bad backs and we were all hurting in the morning. I hesitate to even bring it up because he beds look like they have tried to make them softer. I'm not sure what it is. I only say it so that if you have a bad back you'll know, but otherwise great place! Thank you for the nice review. I'm sorry that the bed was uncomfortable for you. Most people tell me how much they liked them. Personal preferences. Thanks. The house itself was beautiful, the amenities, not so much. The house was great on the outside. The furniture was dated and hard as a rock. The beds were extremely uncomfortable. The dishes and pans were filthy. We had to clean everything before we used it. The basic supplies, paper towels, TP, dishwasher soap, etc. lasted one day which in normal conditions would not have been a problem but we got 18" of snow overnight which made getting to the store a little difficult. There were no shovels or brooms to be found to clear the drive and walks. Fortunately a caretaker showed up around noon to clear the snow. The next time we plan a trip to Big Bear we will pick a different place. Thank you for your feedback. The furniture is actually brand new. We do rely on guests to clean up the dishes they use. I apologize that they did not do that very well. You are provided a good supply of tp, etc, but with large groups or longer stays, you may have to buy more. We were 4 adults. We each had nice accommodations. The back yard being fenced in was great for our 2 dogs. The interior was open and comfortable for the family being an open design. The outside hot tub added an extra treat. We were within minutes from everything. Only sort of negative, a large pine tree in the middle of the driveway made it a challenge to park 2 cars. Should have had a vacuum cleaner. We had nothing to pick up crumbs etc. Overall negatives were very slight. We had an AMAZING time and will make this a summer tradition. The property has a very open flow and it is in a very centralized location near the lake, parks, village, and restaurants. Only issue we had was that the carpet had a lot of dog hair and the blankets were not clean.